I have been thinking a lot about purpose. Questing some things. Trying to dig a little deeper into the theme of purpose and living intentionally. Purpose could mean taking your talents and using it to what you love. It could also mean that it’s important to consider where you are and live intentionally in that place. Purposefully. Understanding that every season is meant for a reason. What a great gift to get such a perfect quote during this month! I thought that this was perfect. When in doubt, do what you love! When you’re sure, do what you love! Passion=Purpose! What if? What if you can’t do what you love to do right now? What if you can’t abandon all because of current responsibilities, other needs, or financial limitations. If you go back to thinking about Thomas the Train, a train is only as good as its track. Being slightly off track doesn’t mean you can’t find purpose in what your doing. If there is a crack in the track causing you to stall, re-evaluate. Fix it. Take a different way. Go another way. Sometimes there are delays. That’s ok. Stay focused. Stay positive. Consider options. Don’t get inpatient with the detour. Enjoy the view. This entry was posted in Chapter eleven, Writer Comment and tagged going off track, Living life with purpose on May 29, 2014 by Beth Barbush. I was standing in the golf course opposite my apartment building looking at the traces left behind in the snow. I imagined a scene where all the skiers, sledders and hikers who made these marks were inhabiting the slope together at once, like the foreboding chaos of a Bruegel painting. This was my first Field Guide excursion into an unknown corner of my new universe—a private country club turned public park over the winter months. As my mid-month reflection for Living Chapters I thought I’d share some observations I wrote down after my walk taken on Saturday, January 5th. I hope they’ll give you some sense of my new found place and transport you temporarily to St. Paul, Minnesota. I felt like Alice in Wonderland passing through the gate and climbing up a steep hill into unfamiliar territory. The sun was bright and it was one of those radiant winter days that helps make this season bearable in Minnesota. Needless to say it was cold, even colder than normal with the Polar Vortex on its way. There was not a cloud in the sky, it’s blue was warm and gem like, and the white desert of snow reflected so much light it took a few moments to adjust my eyes. The first thing I noticed: there were tracks everywhere—bootprints, ski paths, and sled grooves—with the densest overlay on the large hill, the prime sledding spot. Although no one was out playing today I decided to walk away from where the action would normally be found and descended down a series of undulating hills. I came across a partially frozen stream filled with brown autumn leaves that held a perfectly preserved dead frog, floating belly up to expose its pearlescent white skin. Time seemed to stand still here, if it weren’t for the run of water that cascaded from pool to pool to remind me that time and earth are always moving. The landscape was full of bumps and valleys unlike most of the flattened prairie land around here. WIth the snow cover it was easy to forget that this topography was artificially created to give way to long fairways and challenging par fives. The white underfoot was uneven, sometimes hard enough to support my weight other times I crunched through the top crust into the powdery stuff below. The other blue that caught my attention was a cooler, more purplish one, found in the shadows cast by the trees. The silhouettes barely captured the intricacy of the branches. One tree’s veiny bramble brought to mind the delicate outline of flora found in Leonardo da Vinci’s portrait of Ginevra de Benci that I had been looking at earlier after reading a passage by Rebecca Solnit, who referenced it in her Field Guide to Getting Lost. If I were to account for the sounds I heard, a sensory experience that admittedly is less developed for me than the visual experience, I took note of the distant and constant drone of traffic, my own breath and footsteps in the snow, and the wind blowing into my faux fur-lined hood whirling around my ear canal. If I turned south, the wind was at my back and it was warmer, thus I set off in that direction to climb another hill. My reward at the top was a small igloo, the exterior of which was made hard and glassy-looking from the elements. So much so that it almost appeared to be a permanent structure made of some futuristic material. I sat inside this cozy cave, protected, staring out towards my living room window before heading home. 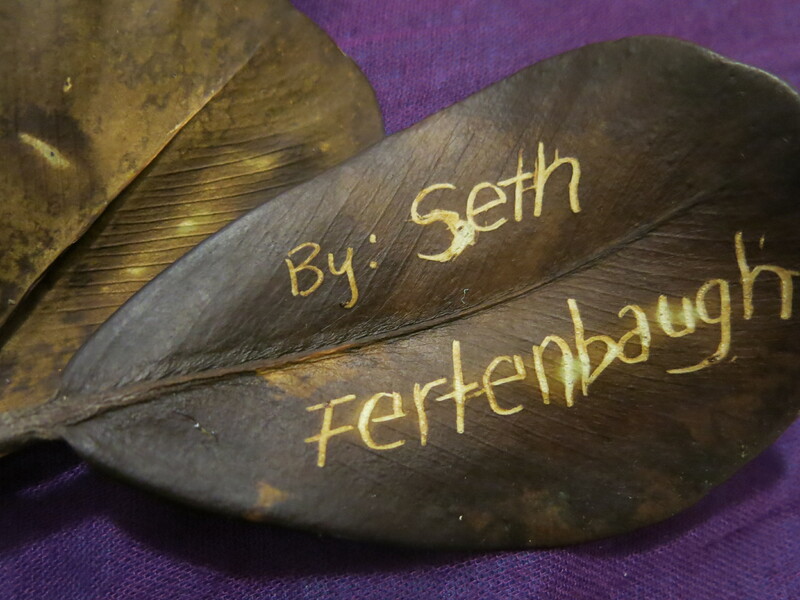 This entry was posted in Chapter seven, Uncategorized, Writer Comment and tagged field guide, Living Chapters, St. Paul Minnesota on January 17, 2014 by Beth Barbush. Chapter four writer, Amy Rothstein challenged me with a series of existential questions to ponder and investigate this past September. 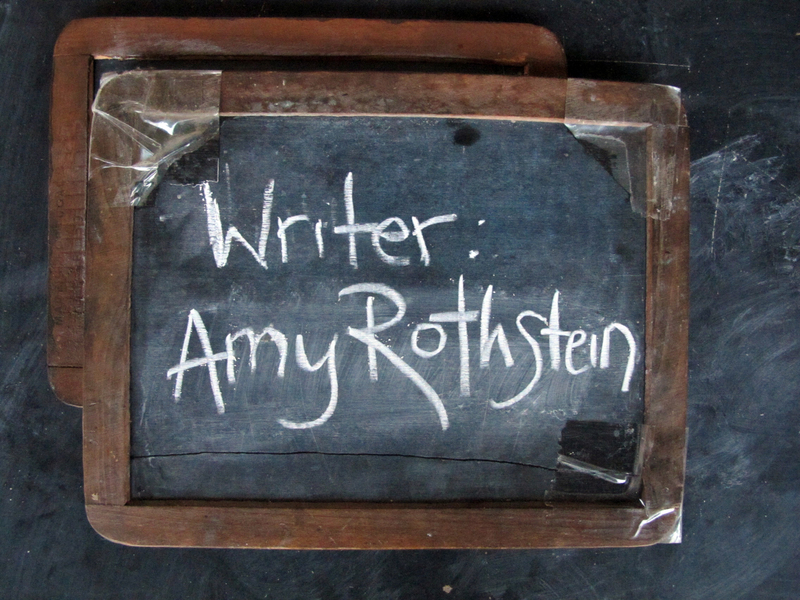 Amy was one of the few writers who joined me on each and every task she suggested for the month including creating a life plan, a meditation practice, and a visit to an isolation chamber. In her post here, Amy shares her reflections on the ideas she explored in that chapter since living it out with me. Since then, I have worked hard to identify exactly what my life situation goals are and to respect and validate these inspired desires. Once that was complete (it was a messy process) I began to proceed with a tangible plan, which is to restart my art making practice after almost eight years of inactivity. The process involved in creating work put a spotlight on the negative thoughts that frequent my mind. My inner critic roared, my skeptical philosopher probed, “why this…what for? !” I was getting in my own way. I found myself relying on past teachings that often seemed like abstract and fluffy concepts. Remarkably, they make sense now that I am using them to help me work on my life situation, and I am changing with the help of these teachings now than ever before. So I would add to ET’s statement that just as it is unwise to build one’s superstructure (or “life situation”) without a foundation (or “Life”), the opposite is also true. It is futile to build a foundation without a superstructure. The goal of building a superstructure (i.e. : overcoming fears, taking on new challenges) motivates one to lean on their foundation. **I can also report that I went to the isolation chamber again recently and I’m not sure I need to go anymore. Meditation is equally (arguably more) effective and I plan to pick it back up again. This entry was posted in December Reflections, Uncategorized, Writer Comment and tagged Eckhart Tolle, existential questions, Meditation, Superstructure on December 16, 2013 by Beth Barbush. During this month of December I asked for feedback or reflections from all Living Chapters players on what has happened thus far throughout this project. 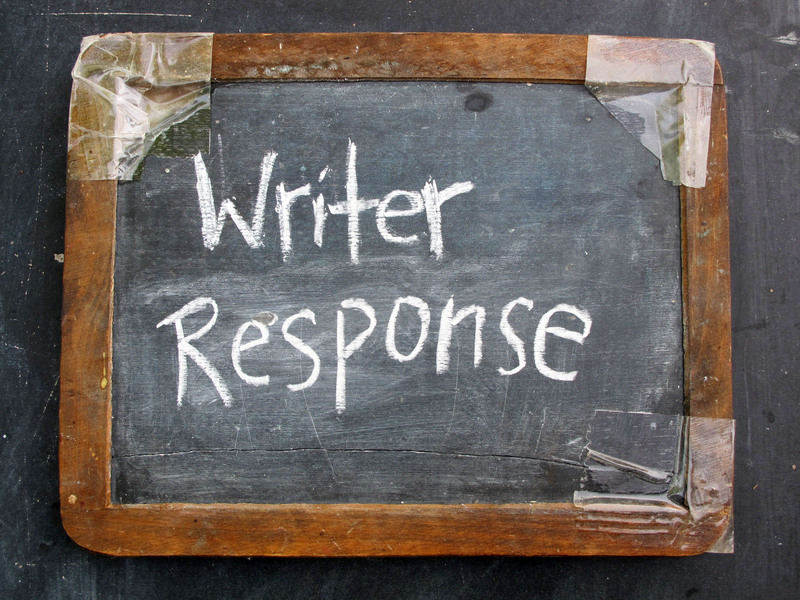 I sent a series of questions to all participants to instigate their thinking and encourage their writing on one or more of the questions. Both of my Boston friends and writers Chapter one: Joe Gallo and Chapter three: Andy Cook replied specifically to several of the questions directly. Below are some of my questions asked and their answers. Do you think this project/process has affected or changed me in any way for positive or negative? if so how? Do you think this process is helpful or useful? Has this project affected you in any way – if so how? Did you have any expectations of what this project would be? How is it the same or different? 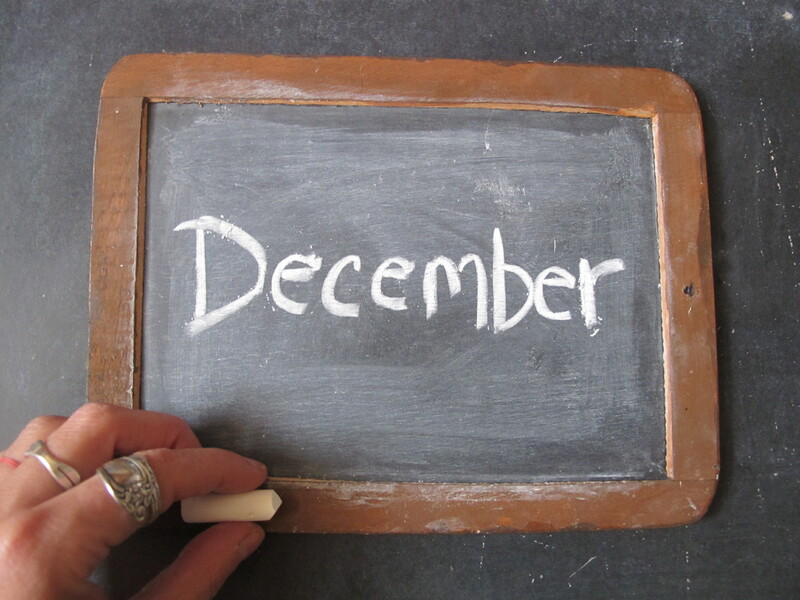 How do you think the month you participated in went? What do you think I got from it? Or what did you take away from it? Do you have any favorite moments or outcomes from what has happened thus far in any of the chapters? What now? Any suggestions ideas or advice for going into the second six months? 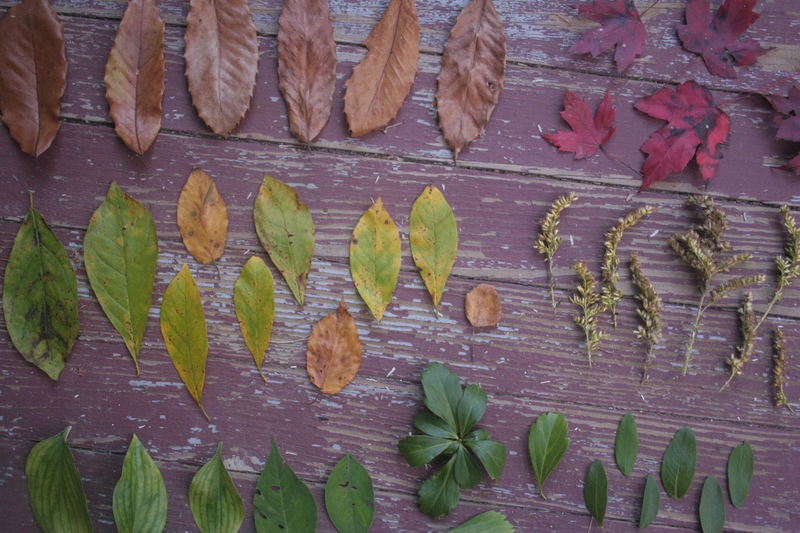 This entry was posted in December Reflections, Uncategorized, Writer Comment and tagged Living Chapters, reflection, Writing on December 10, 2013 by Beth Barbush. After reading Beth’s response to my challenge for this month, I felt inspired by the image she posted of the ghost that has been living in her car. 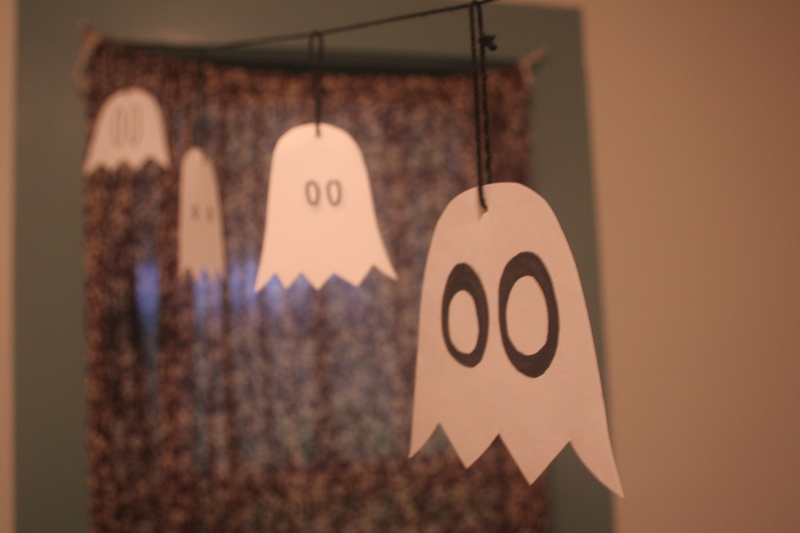 Eventually these guys will journey around the country, spreading Halloween joy, but for now they are strung across my room. A couple of weeks ago I was invited to an Adventure Time themed party. 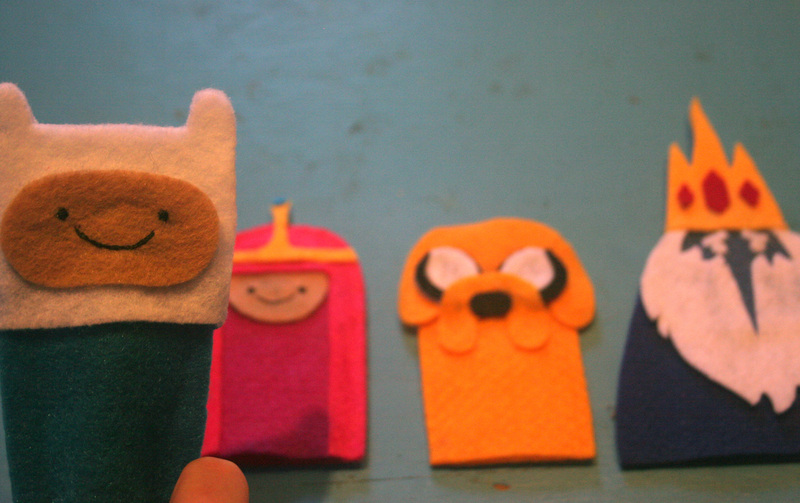 Not knowing what Adventure Time was I googled images and immediately knew I needed to make finger puppets of the characters. Hopefully the Birthday Boy likes his gift! I think that they turned out pretty cute. 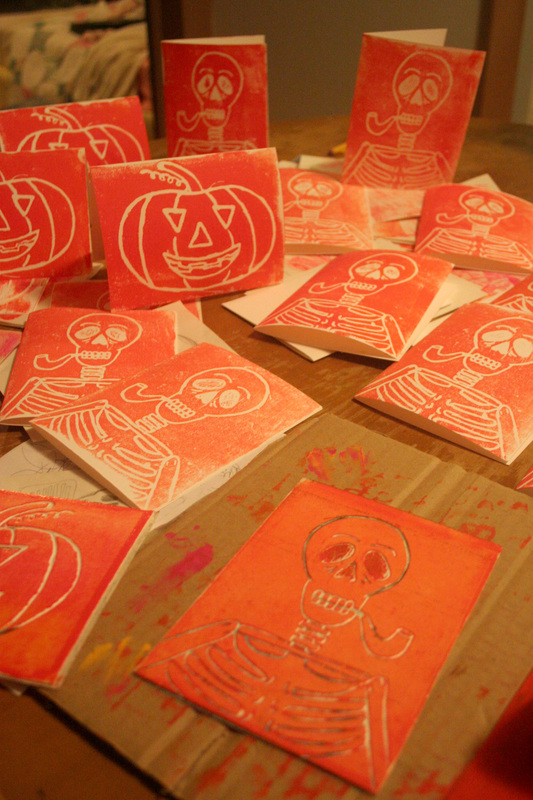 As an art teacher I spend a lot of time creating projects and prepping materials. One of my current jobs is teaching art once a week at the local Montessori school. 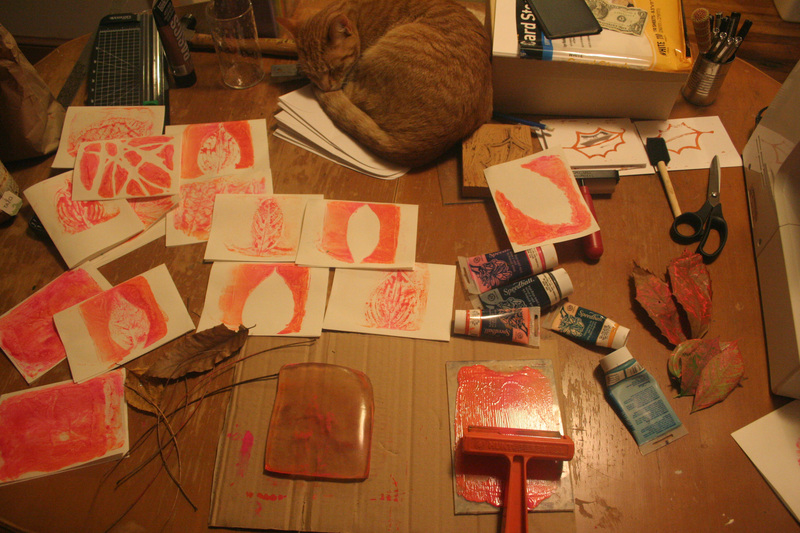 Last week we made gelatin prints, which turned out to be a joyful experience resulting in some beautiful prints. These images show the process I go through on a weekly basis to make examples of the project and collecting materials. 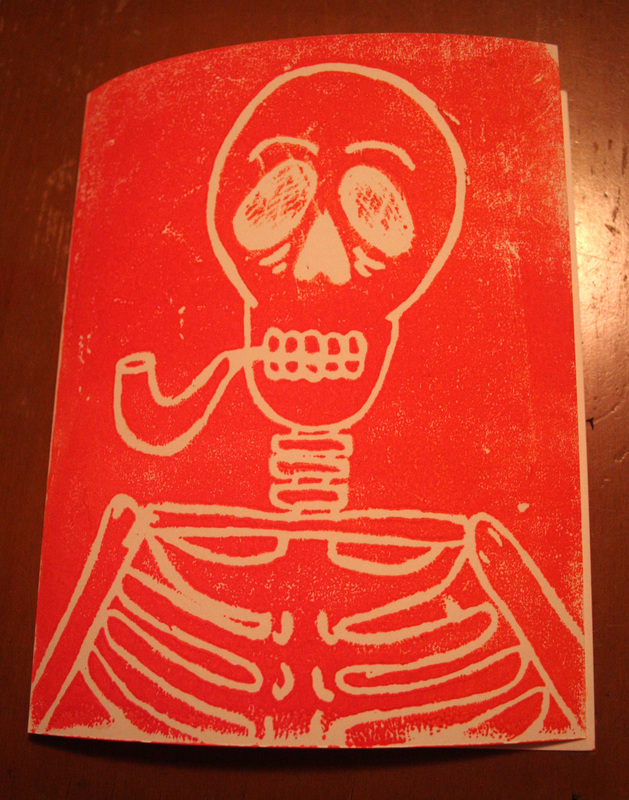 I decided to make some cards using Styrofoam printing plates and while I was searching for some materials I came across this plate of a skeleton that I created last fall. I made it just around this time last year in an attempt to create something to celebrate my grandfather who passed away a several years ago. I say attempt because like many projects that I start I didn’t ever do anything with the plate. I’m thrilled about the prints (which some people will receive in the form of cards) and want to share a little about why I was so inspired to create this imagery in the first place. As Beth has pointed out we share a deep love for Halloween. Part of this love has to do with my fascination with skeletons and the depiction of them functioning as if still living. For this reason I was looking at a lot of art centered around Dia de los Muertos, Day of the Dead, last year and wanted to create a piece of my own that would allow me to celebrate my grandfather, someone who has had a profound impact on my life. My grandfather, Al Nolin, was a man who was always making something new or changing something that already existed. My childhood was spent visiting his ever-changing wooden deck that transformed the back yard into a terraced wonderland. When I was young he sculpted a life-size horse on the basement wall, later deciding to chisel it off due to a leg that wasn’t quite right. He was a man who did as he pleased, living his life the way he saw fit. He constantly challenged people to embrace who they were rather than allow someone else to define them. Not only with his words, but through his actions he inspired me to be a maker of things. His lifestyle and his attitude have influenced me in more ways than I can know. Honestly, sometimes this influence seems like a curse as he was a fairly stubborn man, but I am grateful to have shared part of my life with such a talented and passionate individual. This year has been spent celebrating the life of a loved one lost and remembering that Dia de los Muertos is not about mourning the passing of those folks but remembering the lives they lived. Our protagonist has also been thinking about her grandfather this month. Here is something she made for him. Here are a few other things she has been making this month – check out the Living Chapters Facebook page to see more of the making this month! This entry was posted in Chapter five, Uncategorized, Writer Comment and tagged Adventure Time, Daily Creations, Day of the Dead, Muerto, Writer Response on October 19, 2013 by Beth Barbush.